by Christian A. Nappo, Lanham, MD: Rowman & Littlefield, 2016. 140 pp. $75.00 (hardcover). ISBN 978-1-4422-6260-7. Like many of my former colleagues in the professoriate, I talked little of the thirteen men featured in The Librarians of Congress. Except for a brief mention in the first-year foundations course I taught, this group of directors administering the information needs for Congress at what is considered America’s national library was an afterthought, although as an English major I knew that the twentieth-century poet Archibald MacLeish was a librarian of Congress and as a cable subscriber grateful for C-SPAN’s Book-TV that the Russian scholar James Hadley Billington was nominated, in 1987, by President Ronald Reagan. My initial reaction to seeing the The Librarians of Congress available for review a few months ago, therefore, was an uplifting blend of wonder and interest. I was delighted to see a title that surely would fill a gap in the professional literature and, simultaneously, was intent on reviewing it. I was certain the book would increase knowledge beyond learning the answer to the question, Who is the longest serving librarian of Congress? What I did not expect, however, was to be so entertained by the vital details in these informative biographies that I would suggest The Librarians of Congress be required reading in library and information studies programs. Indeed, were I still teaching I would find a way to include it in, say, History of Libraries or at least offer it as an independent study option. What is more, I might encourage every graduate of an American library school to read this book. Why? “The history of the Library of Congress is the history of America,” Christian A. Nappo writes in the Preface (xiii). 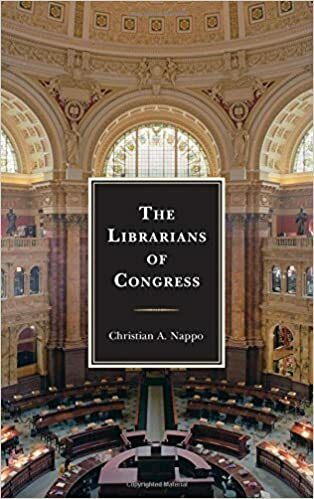 And, with credit to Nappo’s background in American history, this book describes in fascinating and concise narrative the political milieu surrounding the often acrimonious appointments and always challenging tenures of the librarians of Congress. After all, with little or no background in library science but generally accomplished as doctors, lawyers, novelists, journalists, publishers, or intellectuals, these directors were presidential appointments. In the early decades of the Library of Congress (LC), for sure, the head librarian was selected for his support of a winning campaign for the White House, notably the first librarian of Congress, political strategist John James Beckley, by Thomas Jefferson in 1801; the fourth, newspaper executive John Silva Meehan (no relation to this reviewer), by Andrew Jackson in 1829; and the fifth, John Gould Stephenson, by Abraham Lincoln in 1861. While the Librarian of Congress remains a patronage appointment that, with only two exceptions, carries over into successive administrations, Nappo’s book leaves the reader not only grateful for the cultural and intellectual center the LC has become but also respectful of these directors, who made the most with opportunities presented by perpetual information growth and needs as well as with ongoing budget uncertainties, preservation concerns, and, more recently, digitization worries. What is more, the second and fourth librarians of Congress were forced to deal with the aftermath of devastating fires. According to Roy Balleste, director of the library at St. Thomas University School of Law, who writes the Foreword, “Nappo takes us on a journey that expands more than two hundred years and skillfully shares a wonderful story that traverses a portion of American history not well known. For the first time, he connects the stories of the men in an unforgettable and inspirational tale of determination” (xii). To be a more effective ready reference source, The Librarians of Congress would benefit with two inclusions: placing dates of service as librarian of congress in the chapter headings and providing a table displaying the name of the librarian of Congress, his moniker, his hometown and state, his years of service, and the nominating president in an appendix. The book also might have contained a closing chapter that ties the narrative together by emphasizing the intended take-aways or by anticipating the potential political, personal, and administrative demands for future directors. The price tag on The Librarians of Congress reflects its aim as a reference source and thus will limit purchasers to institutions and not the individuals who should acquire it for their personal collections.